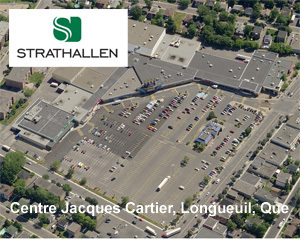 Strathallen Capital Corp. has purchased the Centre Jacques Cartier shopping centre in Longueuil, Que. from RioCan Real Estate Investment Trust and partner Kimco Realty Corporation for $17.6 million. “It’s a neighbourhood mall located on the south shore of Montreal that’s food- and drug store-anchored, which we like,” said Strathallen executive vice-president Jonathan Saguy. The 219,109-square-foot mall is 94 per cent leased and sits on 15 acres of land. It has 44 units and is anchored by IGA, Cinémas Guzzo, Pharmaprix, Value Village, Dollarama and CIBC. It consists of a main L-shaped building, a triangular-shaped enclosed mall and one standalone pad. Strathallen Capital will act as asset manager and Strathallen Property Management Inc. will provide property management services. Centre Jacques Cartier sits at the busy intersection of Chemin de Chambly and Rue Lamarre, and more than 600,000 people live within a 20-minute drive. The property was purchased on behalf of Strathallen Retail Property Fund LP No. 3 (SRPF 3), an investment vehicle comprised of major Canadian pension fund investors and managed by Strathallen. SRPF 3’s mandate is to invest in Canadian retail developments and retail properties with leasing upside and redevelopment potential. “It fits very well into our overall fund portfolio and we feel it complements and diversifies the Strathallen Retail Property Fund LP No. 3 portfolio on behalf of our investors,” said Saguy. The portfolio has a stable of core properties and includes a value-add component for yield enhancement. The closed-end fund has the capacity to acquire more than $300 million in assets. Strathallen is working on raising capital for its fourth retail property fund and expects to raise another $200 million to $250 million. The Toronto-based real estate services company purchased the unenclosed, 391,957-square-foot The Shops at Morgan Crossing in Surrey, B.C. on behalf of AIMCo Realty Investors LP for an undisclosed price in July. That pushed its assets under management to more than $1 billion.